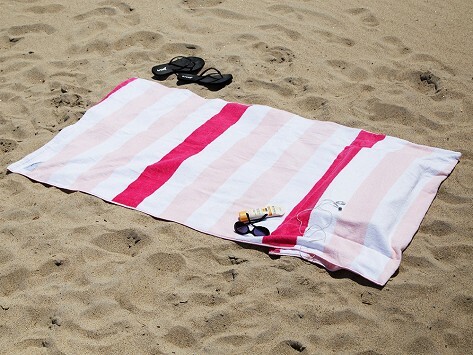 The super soft Tillow is a multi-functional beach towel that is comfortable for you and protective for your essentials. With a built-in contoured foam pillow, you can rest easily at the beach or pool. Camouflaged pockets keep your small items safe from the elements, while a touchscreen window lets you access your phone. Care: Wash towel before first use. Machine wash cold on delicate cycle with like colors. Use only non-chlorine bleach when needed. Avoid using fabric softeners, tumble dry low. Dimensions: 35" x 65" x 2.5"
Perfect for a day at the beach! Large and really comfy! Next time you’re at the beach or pool, or just sunbathing on the deck, use a towel that’s lounge-worthy. The Tillow is a multi-functional beach towel with a built-in pillow, plus pockets to keep your valuables safe from the elements. For Maker Katie Everds, going to the beach meant worrying about her stuff every time she left her towel. And to get comfortable, she’d bunch sand into the shape of a pillow. That’s why she created the Tillow. The contoured foam pillow is removable, with a washable liner that resists water and mildew. And the hidden pockets store your keys, wallet, sunscreen, or any other small items. One pocket even has a touchscreen window that lets you use your phone while it’s protected. Pull up a towel and relax with a ready-made spot for your head and for your essentials.